Born on December 8, 1875 in Tsushima, Japan, near Nagoya, Yone Noguchi attended Keio University, but left for the United States before graduating. In San Francisco, Noguchi worked for a while as a servant to raise money to attend Stanford, before becoming involved with a newspaper run by Japanese exiles associated with the Freedom and People’s Rights Movement. After studying for some months in a preparatory school, Noguchi visted the Oakland hillside home of Joaquin Miller, who encouraged him to become a poet, introducing Noguchi to several San Francisco Bay bohemian writers, including Gelett Burgess—who published some of Noguchi’s poems in the small journal Lark), Ina Coolbrith, Edwin Markham, Adeline Knapp, Blanche Partington, and Charles Warren Stoddard, the last of whom Noguchi fell in love, developing a passionate correspondence with Stoddard, who lived in Washington, D.C. In 1897, Noguchi published two books of poetry, following them with a novel, The American Diary of a Japanese Girl (1902) and another fiction, The American Letters of a Japanese Parlor Maid (1905). His third book of poetry, From the Eastern Sea, received some attention. 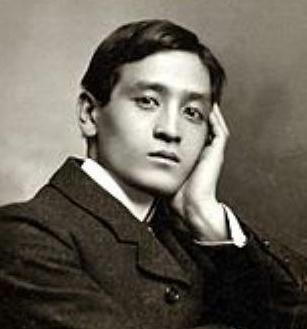 Soon after, Noguchi traveled to London, making connections with major poets of the era, including William Michael Rosetti, Laurence Binyon, William Butler Yeats, Thomas Hardy, Laurence Housman, and Arthur Symons. Upon his return to the US in 1903, and in New York developed relationships with Zona Gale, Edmund Clarence Stedman, and others. Yet the poet continued to have difficulties being published in English until the Russo-Japanese War of 1904, when he suddenly was encouraged to write on numerous Japanese subjects, including a article, “A Proposal to American poets,” in which he suggested they try writing Japanese hokku. Having secretly married Leonie Gilmour, he broke off their relationship in the early months of 1904, determining to return to Japan in 1904 to become a professor of English at Keio University. There he also planned a marriage to Washington Post reporter, Ethel Ames, until he discovered that Leonie had given birth to a baby son in Los Angeles, Isamu, who would later grow up to be the famed sculptor, Isamu Noguchi. Despite a visit from Leonie and Isamu in 1907, Noguchi by this time acquired a second wife, Matsu Takeda, a Japanese woman. Leonie and he formally divorced in 1909, although Leonie and her son continued to reside in Japan. Noguchi continued to write in English after his return to Japan, becoming one of the major interpreters of Japanese culture for the US and Great Britain. His 1909 collection of poems, Pilgrimage, received some international attention, and his work became admired by figures such as Ezra Pound and Arthur Symons, who described the poem as a “scarcely to be apprehended personality. In 1913 he made a second voyage to England, reading at Oxford upon the invitation of poet laureate, Robert Bridges. His work soon after appeared in the pages of Poetry, where he was hailed as a pioneering modernist. But by the second decade Noguchi’s poetry, seemingly traditionalist, fell out of vogue. In the 1930s, Noguchi, formerly associated with leftist magazines, turned, like much of the country, to the right. Because of his friendship with Indian poet Rabindranath Tagore, Noguchi was sent to India by the Japanese government with the hope of gaining favor there of the militant imperialism on the rise. During World War II, the poet avidly stood behind the Japanese cause, turning his back on his former Western ties. After reconciling with his son, Isamu, Noguchi died of stomach cancer in 1947. His selected poems were published by Fairleigh Dickinson University Press. Beat, now high, then low, before my dream-flaming eyes.